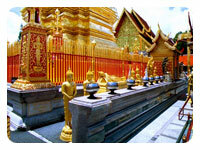 The trip entails a pleasant 15 km.winding drive up 3,500 feet above sea level to visit Wat Prathat Doi Suthep, the most sacred temple in the city. You then exercise your heart, lungs and limbs ( perfect for couch potatoes and those with beer belly ) by ascending the steps to the temple, guarded by two magnificent nagas (naks). 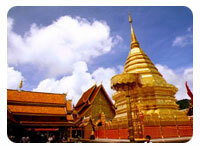 Constructed in 1383, this symbol of Chiangmai contains the holy relic of the Lord Buddha which is enshrined in the magnificent, glowing golden pagoda. 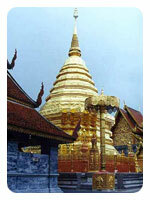 A bird’s eye view of the entire city and the surrounding areas can be seen from the temple grounds. Continue by truck along a bumpy mountain road to visit the White Meo hilltribe village. It’s a scenic route. Migrants from China, they prefer to live in simple, isolated and self-sustaining villages while preserving their primitive culture, ancient customs and gorgeous embroidered costumes. Return back to town.